Episode VII rumors have been flying fast and furious in the days leading up to Comic-Con, with Badass Digest tossing out a ton of huge rumors revolving the plot and characters of J.J. Abrams’ upcoming Star Wars sequel. 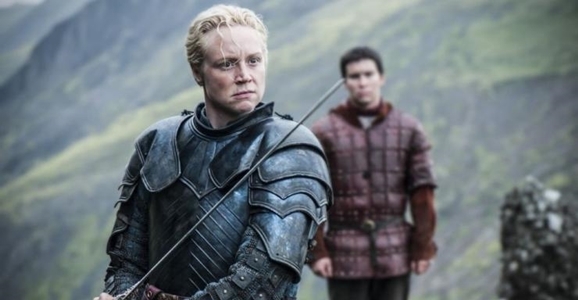 Now they’re at it again, this time offering up a new rumor and some speculation about who Game of Thrones actress Gwendoline Christie will be playing. If you’re trying to remain as unspoiled as possible, well, what are you still reading this for? So, you remember Princess Leia’s crack about Luke being a little short for a stormtrooper? Well, apparently the Empire likes their COs tall as well, because now Badass Digest is claiming that the 6’3 Christie will be playing an antagonist in Episode VII, specifically one who’s pursuing John Boyega’s character, more specifically an Imperial officer of some sort. See, the recent round of rumors began with BD’s claim that the action in Ep VII would kick off with Boyega and Daisy Ridley’s characters coming across a severed hand clutching a lightsaber — a discovery that puts them on a path to meet Han Solo and Chewie, and eventually to take part in a search for Luke, who has been missing for most of the 30 years since Return of the Jedi. They followed that initial rumor by later claiming that Boyega’s character is a former Imperial stormtrooper turned deserter. Today’s rumor, which comes to Badass Digest via their unnamed sources, suggests that Christie’s character will be “hunting” him for some reason, and that the actress “has been seen training with a lightsaber.” That would seem to scream Sith, but BA speculates she is instead the former commanding officer of Boyega’s character. That sort of personal vendetta toward a deserter would certainly give her a theoretical reason to pursue Boyega’s stormtrooper, especially if he deserted at a particularly inopportune time — maybe one that cost the lives of his former squadmates, but that’s just me and my midi-chlorians speculating wildly. But there’s more. Badass Digest says they’d previously heard that one of the Episode VII roles had been gender-swapped during casting. They think that could be Christie’s role, and moreover they think it may have been the same role that Benedict Cumberbatch was supposedly in talks for a while back. Since the Episode VII cast is a bit of a sausage fest, it would make sense to mix things up by casting a female for a role that doesn’t specifically demand either gender. However, they also point out that the Cumberbatch thing was back before J.J. tossed out the Michael Arndt script, although it’s entirely possible that characters or elements from that draft might have been carried over into the current script by Abrams and Lawrence Kasdan. Assuming all — or any — of this is true, one thing I’ll be curious to learn is exactly what the state of the Empire, or its remnants, is as Episode VII begins. The destruction of the Death Star and deaths of the Emperor and Darth Vader no doubt dealt a serious, possibly fatal, blow to the Empire, but it’s not like the entirety of its infrastructure would just fold up and vanish overnight. There would inevitably be Imperial forces out there eager to rally and keep up the fight. In fact, that very possibility was explored in the now-decanon-ized Expanded Universe, and I imagine it will have to be at least touched on in the new trilogy. So if Boyega is playing an AWOL stormtrooper, when exactly did he go AWOL, and from what organization? It’s been 30 years since Jedi as Episode VII picks up, and since Boyega is only 22, I don’t think he could feasibly be a veteran trooper from that era. So that suggests he’s a recent stormtrooper, which in turn suggests there are still Imperial loyalists out there bedeviling whatever government was put in place after the events of Jedi. Given there have also been rumors about resurgent Sith of some sort, I’m guessing there is some sort of new Sith Empire order building power once more, either in secret or in open opposition to Han, Leia, and the Good Guys. And if Christie is indeed playing an Imperial commander, maybe even one who has had lightsaber training, perhaps the divide between the Sith rulers and their rank-and-file soldiers is a bit less clear-cut in the time of Episode VII. After all, maybe with a little Force training, the stormtroopers could actually hit the broad side of a bantha. Of course, this could all be a load of poodoo — so it goes with the rumor game. Either way, I’m looking forward to seeing what Game of Thrones’ Brienne of Tarth brings to the Star Wars universe.